I first heard of Alexander John Shaia on Rob Bell's podcast two years ago. (His interviews can be found here.) 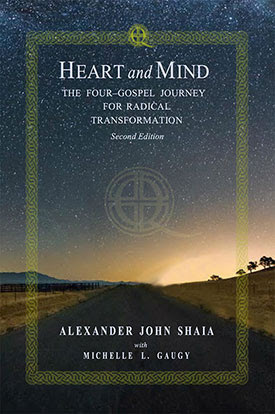 His approach to the gospels intrigued me so I put his book Heart and Mind on my Amazon wish list. He came back on the podcast late last year noting an updated version of his book had come out. But I did not get around to purchasing it. Then right before Lent, Mike Morrell at Speakeasy offered a review copy. Not only am I all about free review copies but this book turned out to be especially meaningful to me during this Lenten season. What makes his take on the gospels so intriguing? He was raised in a Lebanese Catholic family in the deep south, where he watched his grandmother's house burn to the ground from arson because of her faith and skin color. Importantly, her response to her gathered family was "No hate." He grew up expecting to become a priest. He went to Notre Dame and after graduating with degree in Anthropology he went to seminary, which he discovered was not for him. He pursued a PhD in Psychology. He is strongly influenced by Joseph Campbell and Carl Jung as well as his Eastern Rite Catholicism. As he pondered the gospels and their overlapping but sometimes contradictory recounting of the life of Christ, he considered the likely audiences for each gospel, the time frames they were written, and the major thematic locations in each, he had an epiphany. Why did the church choose these four gospels and not the others floating around, even if they contradicted each other at points? Why did the church establish a three year reading cycle based on the synoptics with John's gospel appearing during the holy seasons? Shaia believes these four were selected for their assistance in every person's spiritual journey. He calls them the four paths. Here they are in brief from his website, Quadratos. Contradictions do not matter because the authors are not concerned with retelling history exactly but using the mythic power of the Christ story for encouraging and exhorting church communities. For readers today, we still have metaphorical mountains to climb, rough seas to cross, gardens to heal in, and roads to travel down after our healing. We are never only in a single place, but as we encounter a mountain in one aspect of our lives, needing the courage to continue the climb, we may also be in a garden in another area and need to be exhorted to get up and start the next journey. I found this book very helpful for understanding my next steps in my spiritual journey during this Lenten season. I think it is helpful in any season of life and I am happy to give my review, unbiased by the gift of this book for review purposes.